Anticipation is building for the new TriMet Tickets, a mobile ticketing application that will let you conveniently buy and use tickets on your smartphone. The app – among the first used by a transit agency in the nation – has been in development since last fall and we are now ready to sign up riders for a beta test. The new TriMet mobile ticketing app will make purchasing and using fares on buses, MAX trains and WES Commuter Rail easier, faster and more convenient. iPhone and Android users just download the free app, register a debit or credit card in the secure system, and purchase tickets and passes instantly – anywhere and at any time. No searching for exact change for the bus or using a ticket machine before boarding a train. And no searching your bag or pockets for your paper ticket when boarding the bus or being approached by a fare inspector. Your ticket is right there on your phone. The tickets will have a combination of visually authenticated elements including a day-code, time and date stamp and animation to provide security. 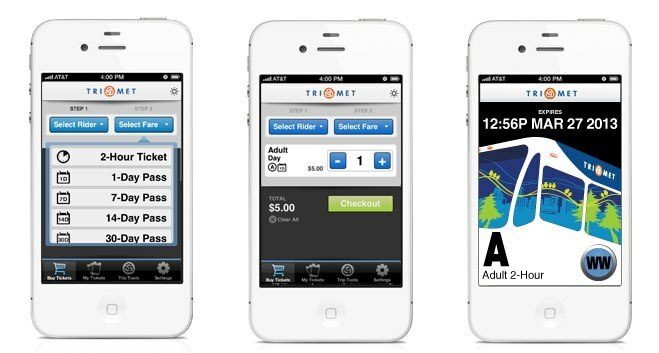 We plan to begin testing the TriMet Tickets app later this spring with applications now being accepted from riders. We’re looking for a cross section of testers and limiting the number to 150 riders so not everyone who applies will be selected to participate at this time. Once testing is done and feedback incorporated, TriMet plans to publically launch the mobile ticketing system later this summer so other bus, MAX and WES riders can enjoy the convenience too. To learn more about the beta test and requirements go to trimet.org/mobiletickets. The mobile ticketing app means less money spent on ticket stock and processing, which will help reduce our operating costs. It will also bring the TriMet one step closer to a state-of-the-art electronic fare collection system that will eventually provide all of you – not just those who have smartphones – with easy and convenient ways to pay your fare.